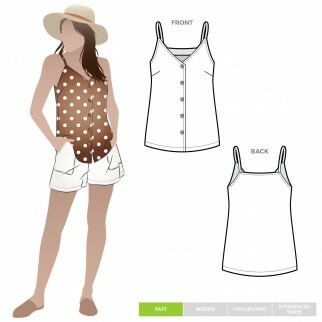 Light and airy this little button through cami sewing pattern will be on high rotation in your wardrobe. With its comfortable silhouette that skims the body, this is a great layering piece to wear under a jacket or by itself on those hot days. These are multi sized nested patterns printed on 60gsm paper. There are two size ranges available for each pattern. Seam allowances are included. Please note, Style Arc sewing patterns come with limited instructions and assume some sewing and pattern knowledge.